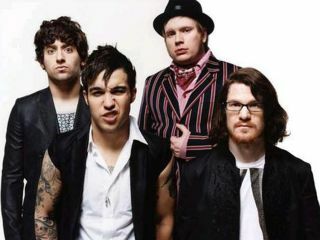 Last week saw Fall Out Boy's upcoming album, Folie A Deux, move from its original release date of 3 and 4 November to 15 (UK) and 16 (US) December. Although there were posts on the band's website that addressed the change, it has still been a source of confusion and concern amongst fans. In an exclusive interview with MusicRadar, Fall Out Boy frontman Patrick Stump explains the band's decision to pull the record from November - while at the same time expressing reservations about a December release. "Initially we wanted to put the record out on election day," says Stump. "We saw the album as something of a statement, and we wanted to make that connection with the release date. Not in an overtly partisan way, just an honest way. People tend to approach politics like sports, which is sad. Stats, who's up, who's down, who's got the better soundbite - this is life-and-death stuff, and we have to treat it seriously. "Gradually, though, we realized that this election is too important to mess around with. We'd be doing radio promo and disc jockeys would be like, 'Okay, let's get out the vote for Fall Out Boy!' It started to feel very gimmicky. This is probably the most important election in a hundred years - certainly in my lifetime - so we thought, Hey, let's not get ourselves mixed up in all of this." "Chinese Democracy is actually going to be out - we sure didn't count on that!" "Moving the record was a huge decision," says Stump," and it didn't make things easy on our label - they have other records on the schedule, so they just can't slot us in anywhere. There's so much involved with the record company machinery; to make one change is like trying to alter the direction of an ocean liner. I'm just glad they got us a release date for this year; that was really important to us. "Is mid-December optimal? No, of course not. Nobody in the band is thrilled about that. It's so close to Christmas. Are we going to be forgotten about in the shopping rush? Will we be that last-minute gift? Who knows? And Chinese Democracy is actually going to be out - we sure didn't count on that! "But because we already have I Don't Care out as a single, to wait for 2009 would have been really bad, maybe even a disaster. Hopefully, everything will work out. We have very loyal fans, so we're trusting they remember us when the time comes." While you're waiting for December, check out the video to I Don't Care. It's a hoot!